Could November put a teetotaler in the White House? Mitt Romney is forbidden drink as a Mormon, so let’s hope that, if elected, he will serve. USS Augusta was FDR’s longest yacht [600’] for the shortest time: Just enough time for he and Winston Churchill to thrash out, over drinks, no doubt, the Atlantic Charter in 1941. That is, let him separate the personal from the presidential. Abstinence is tyranny when forced on guests. ’ I don’t claim, Thirsty Reader, that drink makes a president good or bad; I ask only that hospitality and sophistication rule; that the nation’s greeting be something more warmer than Come on in, the water’s fine. Bush II was teetotal for cause, but he poured Newton Unfiltered Chardonnay, Peter Michael ‘Les Pavots’ and the lovely Schramsberg Brut Rosé for the Queen of England. Other of our presidents have offered only cold comfort. Take Rutherford B. Hayes. At his White House, said Secretary of State William Evarts, ‘water flowed like wine’. The Carters were rigid that way too, and made no bones about it. Ted Kennedy recalled their at-homes: ‘You’d arrive at 6 or 6:30 P.M., and the first thing you would be reminded of, in case you needed reminding, was that he and Rosalynn had removed all the liquor from the White House. Thus the inebriati turn admiring glances toward Franklin Delano Roosevelt. He it was lifted the curse of Prohibition from our parched nation. The Noble Experiment, which promised an epidemic of morality, led instead to a tsunami of crime, corruption, hypocrisy, lost tax revenues and lost jobs. And organized crime made a killing. Literally. The President in a stress-reducing moment. No man of the people—him with his WASPy pedigree and his cigarette holder—FDR nonetheless had the common touch. He campaigned to end Prohibition and did so first chance he got. In March 1933, scarcely three weeks in office, he legalized beer and light wines, and the horses were out of the barn. Clydesdales toured the suds-loving cities of the East and Midwest even as brew was shipped to the White House by air. With a Repeal amendment already rolling, the jig was up in jig time. When Utah ratified Repeal that very December, Prohibition was, at last, dead as a smelt. In the White HouseFDR instituted for his staff and pals what he lightly called the children’s hour, at which they relaxed at day’s end, draining stress not over the traditional cookies and milk but over cards, tobacco and martinis, with the two-pack-a-day President as Mixologist-in-Chief. Now the classic martini—dry gin, vermouth, olives or lemon twist—is the Fred Astaire of cocktails [the Manhattan is the Cary Grant]. Proportions are a matter of to taste but should always maintain the drink’s Fredly style: lean and elegant. Likewise the question of shaking or stirring is a personal matter: the former gives more texture through its raft of ice shards [created by vigorous muscle-work if you don’t have something like the Post-Imperial shaker shown below]; the latter gives silky smoothness. Shoot anyone who brings up that wheeze about stirring clockwise vs. counterclockwise. The Post-Imperial Cocktail Shaker, freely adapted from a 19th Century device. The artist Benjamin Cowden created it earlier this year. See a video, and other of Cowden’s unique scultpures, here: http://www.twentysevengears.com/Portfolio.html. Here’s the shopping list for the basic or classic martini: two ounces of gin and ¼ to 1/3 of an ounce dry vermouth plus olive garnish. Eric Felten, whose recipe that is, also offers a version of ‘classic 1930s proportions’—adding just a wee bit more vermouth plus two dashes of orange bitters. FDR went perhaps a little beyond the pale. His specialty was the dirty martini, a variation that requires a potent dosage of olive brine. To make matters worse he mixed his dirty martinis personally, relentlessly and, if the we read the fossil record aright, very, very badly. Indeed he bids fair to go down as the most enthusiastic and least competent of presidential martiniphiles. Some guests are said to have dreaded the soirées for the sheer awfulness of his martinis which, dirty or not, have been described as ‘soggy with vermouth’ and/or mutilated, according to staffers cited by Nannette Stone, with orange juice, grapefruit juice, absinthe and even anisette. Whether from design or exuberance is unclear. FDR & Co. aboard Vireo, which is now displayed, handsomely restored, at Mystic Seaport. For more: www.mysticseaport.org. FDR’s ice yacht is in the National Parks Service’s ‘custodial storage facility,’ a name that suggests the cavernous warehouse seen at the end of ‘Raiders of the Lost Ark’. Odds of its ever being seen again don’t seem very good. Now a favorite with San Francisco party planners, the ex-Coast Guard cutter Electra had a subsequent career as FDR’s presidential yacht. The smoking lamp was always ‘lit throughout the ship’, as Navy lingo has it; the drinking lamp was too. 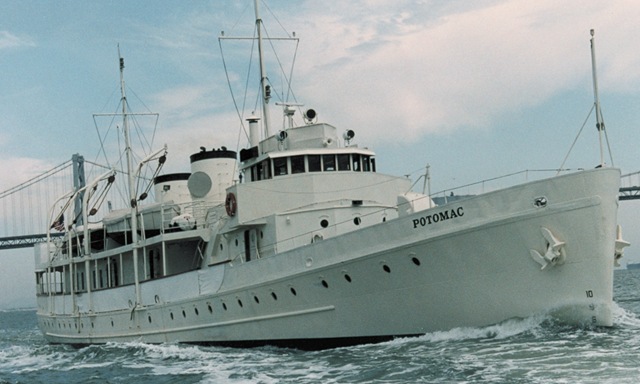 FDR’s other presidential yacht was the Sequoia. Charter one or both at usspotomac.org/ or sequoiayacht.com/. floated in seas of irony. The former, built for government work, became a rich man’s toy; the latter, built as a rich man’s toy, joined the government. 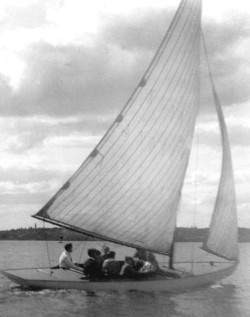 Both were used against rum-runners. Of all people. 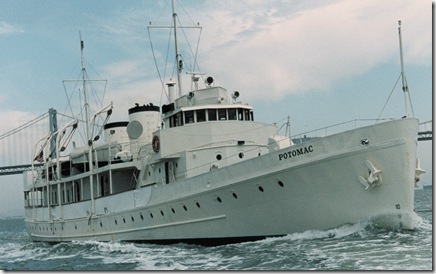 Retired, the Potomac was briefly owned by Elvis Presley; the Sequoia was dumped, like the White House liquor and the Panama Canal, by Jimmy Carter. Quite the little housekeeper, our Jimmy. 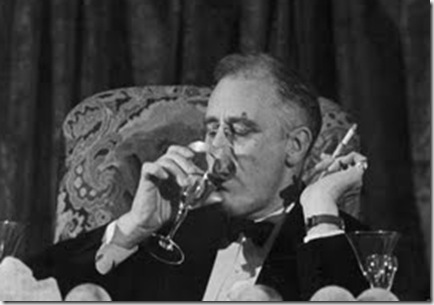 In an era before sound bites, the term Martini Diplomacy never surfaced, but FDR certainly practiced it. Certainly it sealed his friendship with Winston Churchill, who would say that meeting FDR ‘was like opening your first bottle of champagne; knowing him was like drinking it.’ As to just how much FDR drank, that is a vexed question, and you wouldn’t like to rely on the testimony. His friends, and there were many, swore to two small drinks and in bed at 10, but his crew of flame-keepers have been counterbalanced by his detractors, equally numerous, who’ve gone so far as to claim that he was regularly carted off to his room by his Secret Service agents, singing college fight songs as he went. We must settle for the fact that he did as much for the martini as to it, and that he set a high standard for presidential hospitality. Long may it wave. Which gin for the martini? Good question; one that invites exploration. Cocktail King Dale DeGroff [very cold, straight up, olive and twist] favors Beefeater but nods he favorably toward several others: Tanqueray and Tanqueray 10, Old Raj, Bombay White Label, Gordon’s, Plymouth [left, in its new and much-improved bottle] and Sipsmith. Explorers are in fact spoiled for choice, as there’s also vociferous support for Boodles, Bombay Sapphire, Junipero, France’s Citadelle, Tanqueray Malacca, the rare and insanely priced [$700!] Nolet Reserve, and even one of the bargain-priced oldies, Gilbey’s. Among others, such as Broker’s, which has been getting attention and awards recently. But in vermouth you have essentially two choices: Martini & Rossi and Noilly Prat. M&R is DeGroff’s favorite; he says NP is ‘very in-your-face and can overpower the more delicate gins’. Maybe that’s because NP has, sadly, ceased to bottle the martini-oriented vermouth it had long provided to the American market; instead it’s concentrating on its Euro-style aperitif version. Here and there you’ll hear a voice cry out for the less-known likes of Boissiere [sounds French but is Italian] and California’s small-batch Vya. But vermouth there must be, in detectable quantity. Ignore, please, the 15:1 bravado of the Mad Men era, likewise the foolishness of ‘showing the vermouth to the gin’. That top-hatted, walking-stick-wielding bon vivant of old Lucius Beebe wrote prose so florid, Brendan Gill said, ‘that one could have built grottoes out of it,’ but when it came to such nonsense as naked martinis he wasted no furbelows on the show-offs: ‘Anything drier than 5:1’, he said, ‘is just iced gin’. Anonymous, most prolific of experts, goes further: ‘Ordering a dry martini means you are a sophisticate. Ordering a large glass of cold gin means you are a drunk.’ ‘Nuff said. 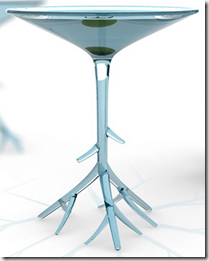 As for glassware, by all means prefer the conical stem, the glass that means martini around the world. But one of a ordinary size, please. The fad for glasses the size of hubcabs has not quite abated, but they’re clumsy to handle and cause what begins as a briskly cold drink to turn warm and soupy right before your eyes. Also shun anything fragile, ill-balanced and spill-prone, such as Benjamin Hubert’s unique but risky design at left, a dry cleaner’s dream. A martini on the rocks reposes in an Old Fashioned glass. Martinis, finally, are made with gin: that’s their default spirit. Substitution requires a modifier, as in the vodka martini. Anything else? No, nothing else. Any old booze can be flung into a stemmed glass and often is, but that does not a martini make. Come we now to the what scholars and academics call ‘the literature’, which exists in plenty. Any respectable personal library might well include Eric Felten’s suave How’s Your Drink? : Cocktails, Culture, and the Art of Drinking Well, Dale DeGroff’s The Essential Cocktail: The Art of Mixing Perfect Drinks, Gary Regan’s The Bartender’s GIN Compendium, Nannette Stone’s The Little Black Book of Martinis: The Essential Guide to the King of Cocktails, A. J. Rathbun’s Good Spirits, Imbibe! : From Absinthe Cocktail to Whiskey Smash, a Salute in Stories and Drinks to "Professor" Jerry Thomas, Pioneer of the American Bar, by David Wondrich and Dale DeGroff, and William L. Hamilton‘s Shaken and Stirred: Through the Martini Glass and Other Drinking Adventures. Nothing quite like curling up with a good book and a good drink, eh? Cheers! Always enjoy the historical context in which you put the alcohol beverage bits! Horrifying, though, to think of teetotalers in the White House–what a terrible impression on visiting dignitaries. And god bless FDR. 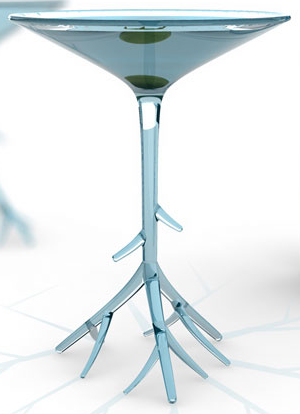 Thought the martini glass–or at least the photo thereof– by B. Hubert was stunning (though, agreed, highly impractical), but was wondering why the contents were BLUE?